Other names: Century, Bitter herb, Bitterbloom, Common Centaury, European Centaury, Feverwort. Habitat: The plant is native to Europe, and is naturalized in North America. It grows in sandy soils, on heats and bare grounds. Description: Short, erect, biennial plant. It reaches half a meter in height. The stem is branched near the top, hollow in the older plants. Basal leaves are forming a rosette. The stem leaves are oppositely arranged along the stem, oblong and egg-shaped. Flowers are red or pink, almost stalkless, They are flat-faced with yellow anthers. Centaury flowers during summer, from June to September. 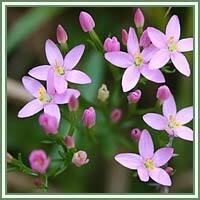 Medicinal use: Centaury was traditionally used as a blood purifier and in treatments of jaundice, wounds indigestion, sores and rheumatism. Today it is applied in cases of digestive complaints, as an appetite stimulant (thus being very helpful in treatment of anorexia nervosa), and as digestion stimulant (useful in case of dyspepsia). It also stimulates stomach and intestinal glands, and can be very beneficial in relieving gases and constipation. 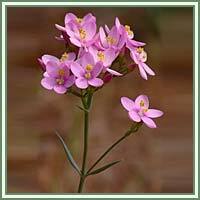 Centaury tea is useful in cases of colic, anemia and heartburn. Used externally, the lotion can be helpful in removal of blemishes.